This program features a hands-on introduction to the philosophy and methodology of Lean process improvement. Participants apply the techniques to an actual work process and construct an implementation plan to enact the improvements. Agencies are encouraged to enroll groups of four to seven members who share a common work process. Participants should consult with BET staff in advance about the process selected and with the manager who will sponsor the project. Those registering without a work group will join a team from another agency for the hands-on portion of the program. Visit the Lean Calendar page for more coming events. 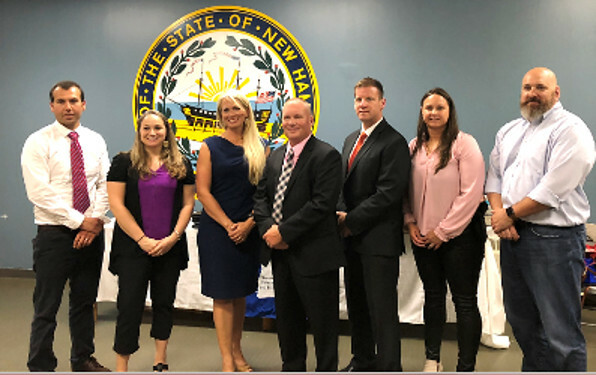 Left to right: Dan Hrobak (Department of Environmental Services), Amy Maltagliati (Granite State College), Kelley Achenbach (Department of Safety), Tom Lencki (Department of Safety), Jeff Ladieu (Department of Safety), Becky Eder-Linell (Department of Safety), Dan McLeod (University of New Hampshire). Missing from photo: Joy Sabolevski (Granite State Independent Living). Set your sights to learn the latest Lean techniques. Become a yellow, green, or blackbelt. See what we are reading and what we recommend for others who want to learn about Lean. Plus, check out the Lean activities that are occurring throughout the state and elsewhere. If you need a mentor, or just want to hear from someone within the State of New Hampshire visit our resources page. Visit this page to see who is involved in Lean at the state, and where to go to contact them. See some of the lean projects done across the State. Take a look at some of the upcoming events and meetings in our Lean community.